Thanksgiving is my favorite holiday! I get to cook (I don't clean up) and I get to hang out with my family. 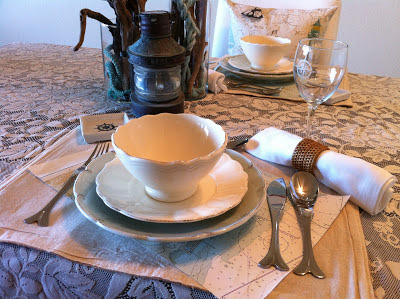 I have so much fun getting out all of my grandmothers' china and silverware, then mixing it all together with a few choice coastal elements to create something very festive. It's a pretty low stress holiday for me. Love it. Here are a few ideas that I have been collecting for inspiration - Enjoy! From one of my all time favorite holiday articles from Coastal Living Magazine - I actually kept this pinned on my bulletin board long before I figured out how to find it in digital version. 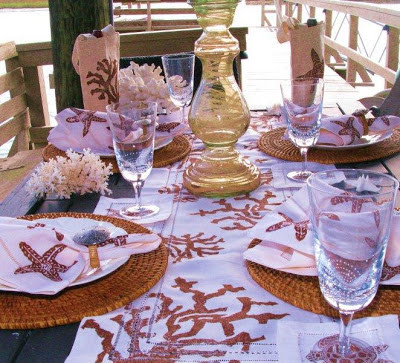 A simple driftwood twig piece, orange fall-toned dinnerware, mixed with rustic raffia and gorgeous stemware. Yep, this would work for me! 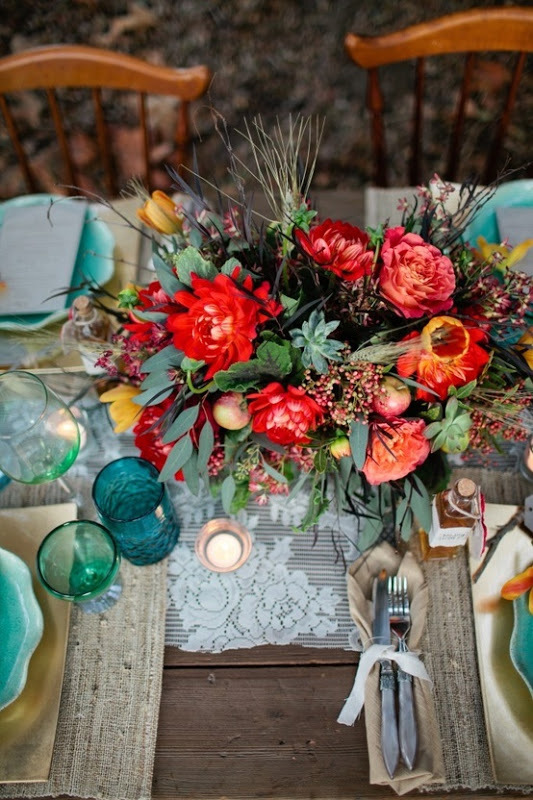 Wouldn't this rustic table decoration be fun for an outdoor Thanksgiving celebration? That is, if you are lucky enough to live where it will be warm this year! So simple, just natural fall leaves and red berries slipped into a large glass vase filled with green hedge apples. I have no idea what those are, so I would use "green" somethings that are local to our area ie: Granny Smith or even Gala apples would look great. Just take a look at this spectacular arrangement! How fun - I especially love the branch coral silverware and the mix of coastal themed dinnerware. The amber glassware is just divine! You must pop over and see all of the details at Rattlebridge Farm! Oh, a travel destination table scape! Now isn't that a fun creative idea?? You could use maps (or nautical charts) for parts of the world that your family has traveled to. 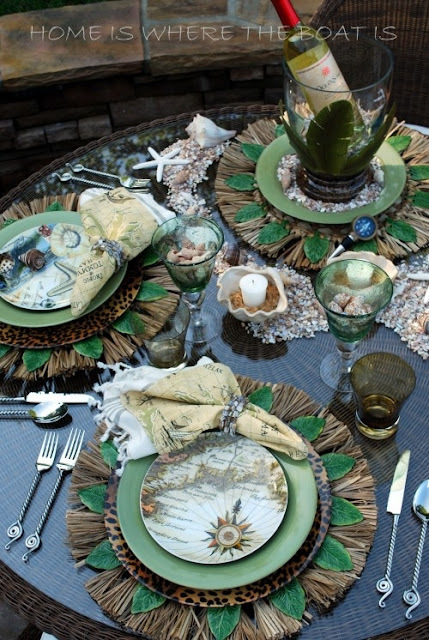 Mix in a few white and brown seashells and you've created something coastal and very special! Can you just imagine the fun memories and conversations this would start around the dinner table? 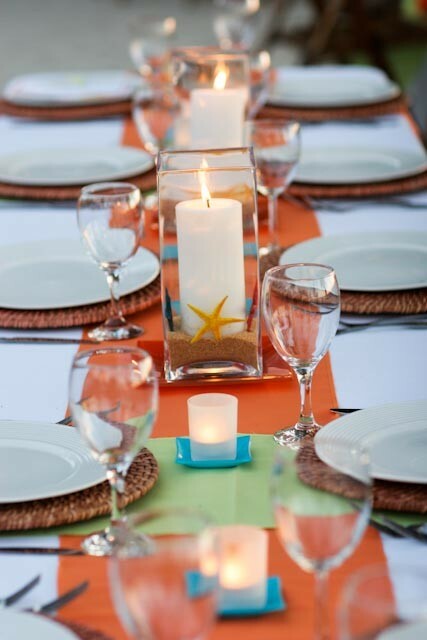 Simple and easy to create this orange beachy table setting! Here's another idea - use coastal themed table linens in fall colors! 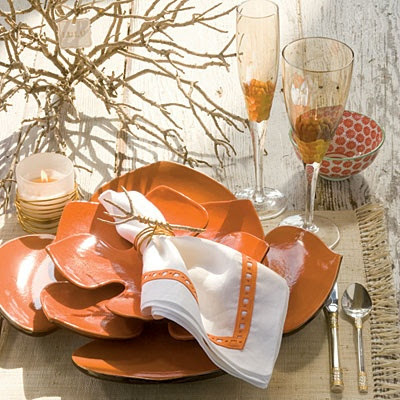 Add a some fall elements, like tiny pumpkins, and you've got a pretty beachy Thanksgiving table. 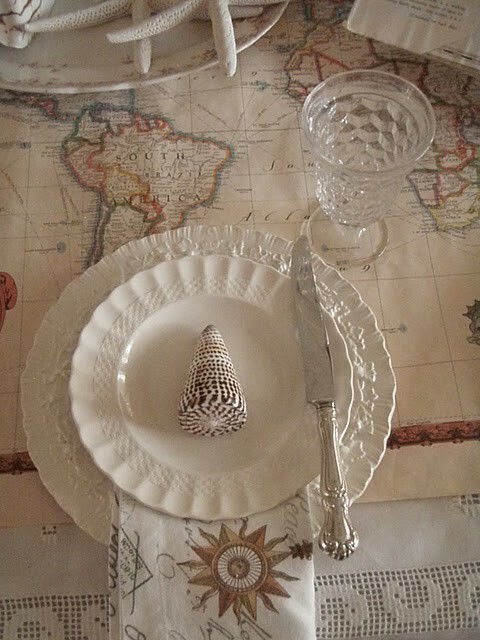 From my Gourmet White Wine Steamed Clam post - here's my experiment for another fun "nautical" themed tablescape. Nautical charts, rope, a vintage lantern and driftwood all create a fun atmosphere for a holiday table. P.S. This clam recipe is totally scrumptious! Have a great weekend everyone! We are off this afternoon to see James Bond - can't wait. That's the best selection of original table ideas I've seen! Thanks Caron (I probably won't act on them, but I so enjoyed seeing them).